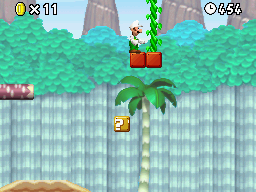 World 6-2 is the second level of World 6 in New Super Mario Bros.. This level has rising water similar to Mondo from Super Mario World. Excluding tower, castle, and ghost house levels, it is the longest level in the game. After the Red Warp Pipe, the player should see a ? Block with two coins above it. In between those coins are two invisible blocks, one containing a Beanstalk. Mario should climb it and press a P-Switch, jumping across some flying ? Blocks to get the first Star Coin. Soon after that, Mario should reach two tall cannons. One takes Mario to a bonus area with several flying ? Blocks containing a total of eight 1-Up Mushrooms and 120 coins, and the other is a Pipe Cannon that takes the player to the second Star Coin. Mario can get the last Star Coin by going past a few Spinies. When Mario goes through the yellow Warp Pipe, he will reach the Goal Pole. Star Coin 1: Mario should hit a hidden block containing a Beanstalk, then and hit a Brick Block containing a P-Switch. Then, he should run along the trail of Blue Coins until it wears off. Star Coin 2: After the third green Pipe, Mario should wait for the water to rise, and then jump or Wall Jump. Star Coin 3: There is a ? Block containing a Super Star. Mario should grab the Star, and when the water lowers, run through the Spinies and get the Star Coin. This page was last edited on April 6, 2019, at 01:44.